Introduction: This note is merely a summary of Saint Teresa of Avila’s great book on Catholic mysticism, The Interior Castle, which was first published in 1588. The Saint herself, a Carmelite nun, was a great mystic, and her personal style of writing demonstrates that she composed The Interior Castle from profound personal experience. Her Feast Day is October 15. 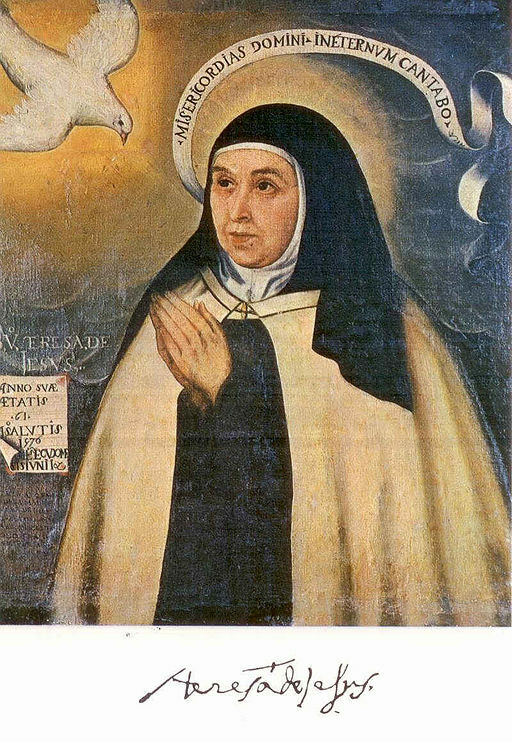 Image: According to Wikipedia, “This is the one portrait of Teresa that is probably the most true to her appearance. It is a copy of an original painting of her in 1576 at the age of 61” (original by Fray Juan de la Miseria), Public Domain, U.S.A.
References: I am relying primarily on the text of Interior Castle itself, including the Introduction by E. Allison Peers (Image Books); and the essay on Teresa of Avila by Mary E. Giles in Great Thinkers of the Western World (HarperCollins); and The Way of Perfection by Saint Teresa of Avila (Image Books); and Ralph Martin’s audio presentation on Saint Teresa available at renewalministries.net. Regarding 15.4 above, Saint Pope John Paul II wrote, “[Although] the journey is totally sustained by grace, it nonetheless demands an intense spiritual commitment” (NMI 32). The word “mystical” can apply even to the purgative stage of the journey inasmuch as the life of sanctifying grace is a supernatural power.